Lord Roger and the king looked equally displeased, making Adam bite back a smile. –after Kit decides to follow the queen’s latest fashion, i.e., no veil, and her husband sends her back to get properly dressed! Ms. Belfrage has done it again. Under the Approaching Dark is book 3 in The King’s Greatest Enemy series, and it has passion, intrigue, and politics to keep the reader turning pages. If you aren’t familiar with England in the 1320s, never fear. 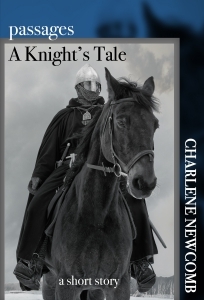 Plunge into this book and you are introduced to the major players – the fictional Lady Kit and her husband Adam and the actual historical figures Edward II, Edward III, his mother Isabella, her lover Roger Mortimer, and others. We aren’t overburdened with backstory: it is woven in bits and pieces where needed. Ms. Belfrage draws us into the 14th century for a taste of life of the ordinary man, the minor baron and his wife, and of the royal family. It is easy to picture towns and manors, magnificent castles and minsters. And after visiting Lincoln last year, I was enchanted by Ms. Belfrage’s description of that medieval town, cathedral, and bishop’s palace. It took me back – it all feels authentic. The novel brims with treachery, treason, and romance. Battle scenes, torture, and love scenes – some may be too graphic for the squeamish, but they are well written, full of emotion. There are great threats from rebellious barons. There is tedious everyday life and plenty of tension – between Adam and Kit, between Adam and the young king, and between Adam and his former lord, Mortimer. But I think what I most enjoyed about this novel is our window into the world of the young King Edward III. He becomes king when his father is deposed, and is a pawn of his mother Queen Isabella and her lover Roger Mortimer. Edward is bright. He is politically astute (most of the time). He knows – and resents – the control his mother has as regent. But he is also a vulnerable. This reader is rooting for him and greatly anticipating Book 4 in the series to see Edward as king in his own right. Thank you for the lovely review – and I had to laugh at your choice of memorable lines. And yes, Kit committed a major, major mistake, didn’t she? Congrats on publishing another wonderful book, Anna.